In a day of hard work optimising websites, it is good to take a moment, relax and recharge your batteries. Spending 5 mins playing a good online game can do the trick (or make you even more stressed out). The name is not really original, but the game is quite fun. It is a Mario Bros-like game, where you need to collect things and destroy enemies ( PDAs and Router) by jumping on them. This one is the most creative and fun. Your mission is to win the spam war by fighting different characters including Mr Redirect, Cloaking Monster, Link Farmer and Hidden Text Kid. The referee for the matches is Matt Cutts! This game is not too related to SEO, but is quite addictive. It is basically the flash version of the Wire Buzzer game. “Seek and you shall find” is the slogan used by the popular job board attracting thousands of candidates each year and helping them to find employment. However in today’s complex economy you should be thinking “Network and you shall Work”. Although many organizations and agencies are still looking for good search candidates, there have not been quite so many advertised job listings. So if the jobs are not posted live each day, how do you find them? Networking is the key to finding any job, it is how I, as a recruiter, find the live opportunities for candidates and it is how candidates should be finding out of where the opportunities lie. Asking friends and colleagues is the first port of call, joining groups and associations is next, actually meeting people who have similar interests face to face and then you will start to find out where the real avenues to success are. So how will knowing Shai, Alban or I benefit you? Well when I have a live role to fill my first port of call is always my network, so if you are not in my network it will make it hard for me to let me know where the opportunities lie. If you are in my network and an opportunity comes up I can keep you up to speed, even if it is not something I am working on as a recruiter. If you are an organization looking for good search people, then there is a good chance I can locate you someone, who I already know to be successful and can add value to your business. Thanks again to Alban at SEO BLOG SYDNEY for partnering with Xpand to help all those working in the search industry Australia. Over the past 2 years, we have noticed a large interest for information on employment and recruitment in the SEO/SEM industry such as tips to find a SEO/SEM job, salary surveys and job offers. We have developed the Australian SEO SEM Salary Survey as well as a job board, but we have decided to move to the next step by teaming up with Shai Roitman and Ronan Mahon, two recruitment experts from Xpand, one of Australasia's leading digital media recruitment agencies. Shai and Ronan will start posting next week with fresh SEO/SEM jobs offers, tips and plenty of information to help you find a great job (if you are a job seeker) or a brilliant candidate (if you are a recruiter). Please give these guys a warm welcome! Google has launched enhancements in its search engine results pages. The new features have been introduced to reflect some of the trends in search engine user behaviour as well as improving the search relevancy and experience. You have probably noticed the "did you mean" in red when typing a misspell word. Google has actually released two more aggressive features. According to Matt Cutts, the internal name code are spellmeleon and chameleon. Chameleon makes mid-pages suggestions when Google 'think' the user is looking for a more specific search. Spellmeleon is going even further by displaying results of a 'corrected' search query before the results of the original search query (see below). Another very interesting feature especially for the user, is the search option. Many websites already have such feature; it allows categorizing the search results based on a set of criteria such as type, date, price etc. Google has finally implemented the same thing on their SERPs! To access the options, we need to click on the Option link in the blue retangle at the top of the page. Once you have clicked, you should be able to sort content by type (video, review, forum) by date and more. 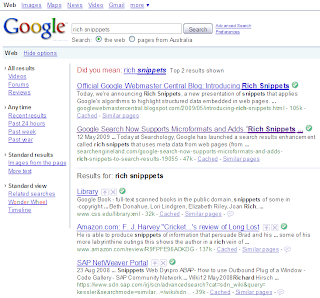 One of the most exciting new feature is the use of rich snippets. Traditionally Google listings or snippets only displayed the page title, the meta description and the URL. Then Google introduced SiteLink, SearchWiki. 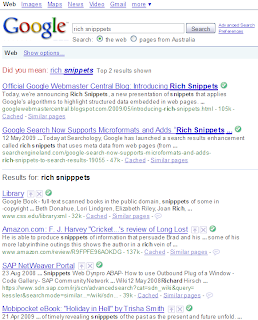 On Tuesday, Google announced the release of rich snippets. With rich snippets, Google will provide more information on your website directly in the SERPs so that users will know what to expect when clicking on your site. At the moment, Google only support information on Business, People and Reviews. The rich snippets will be rolled out slowly starting with 'trusted websites' (LinkedIn and Yep), but over time more and more websites would be able to display rich snippets. To display Rich Snippets, Google rely on microformats and RDFs, that any website owner can add to their code. This will involve a bit of work, but it could be worth it as Google estimate the rich-snippets should increase the click-through rate. In these tough times, it always good to rely on good resources to find a job or find employees. I recently came across an interesting one called Digital Media Jobs. It is a niche online job board specialising on digital media jobs in the Australian industry. The site is open to both job seekers and employers with an interesting concept. As a job seeker, you can reply to job offers and post your resume online for employers to contact you directly. Employers have similar abilities; they can crawl the resume database to contact potential candidates and post jobs. Digital Media Jobs was launched not long ago but has already managed to attract prestigious employers such as Fairfax Digital, NineMSN and Yahoo7. If you are looking for job or employee, have a look at it.